When it comes to clutter and organising, so often we start looking for solutions only once things have got completely out of hand. But if you’re moving into a new place, why not take this as an opportunity to do things right from the start? By putting these eight organising systems in place at the beginning, it’ll be easier to keep things organised for the long term. 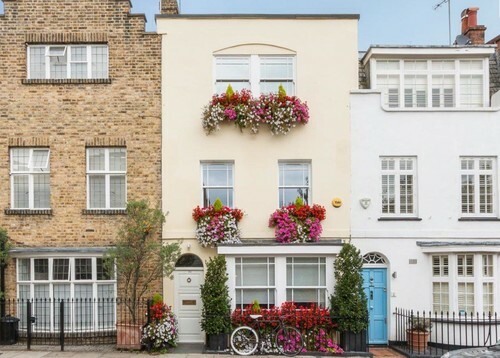 Labels The truth is, much of the labelling you see in beautifully styled home photos isn’t really necessary. However, there are times when it can be a real game changer. For instance, if you store your spices upright in a drawer, having labels on the lids means you can find what you need at a glance. A simple roll of masking tape and a permanent marker can make quick labels in a pinch, and they’re ideal for labelling leftovers in the fridge or freezer with the name and date. Small stuff sorters Medications, first aid supplies, craft items, spare light bulbs – every household has its share of little stuff. These kinds of items, which tend to come in all sorts of odd shapes and sizes, can quickly cause chaos in cupboards and drawers. Prevent toppling piles by stowing little things inside labelled boxes, which can be stacked on shelves. 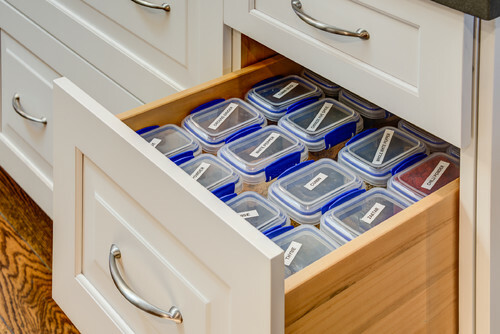 Drawers are another place where small items tend to cause problems. 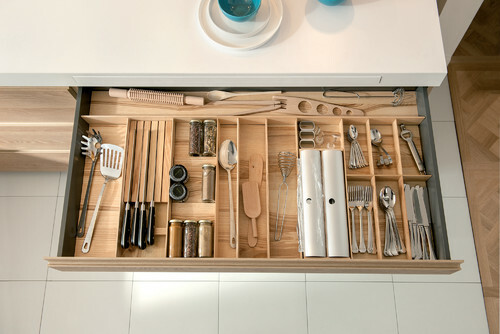 Start things off on the right note by putting simple drawer organisers in place wherever small items are stored: kitchen drawers, miscellaneous drawers, desk drawers and hallway drawers can all benefit from organisers. 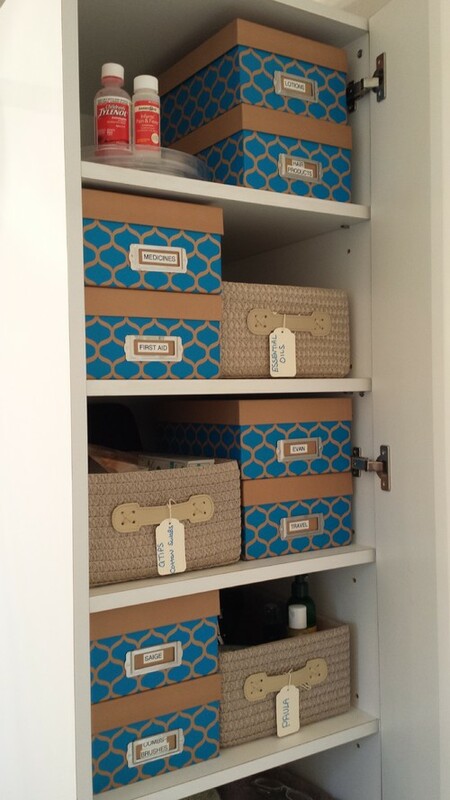 If you’re purchasing organisers, measure your drawers carefully before shopping to be sure you get the right fit. Hallway arrival zone A neat spot to stash your belongings when you arrive home is essential. Without it, those coats, shoes, bags and papers will spread throughout the house in a heartbeat. 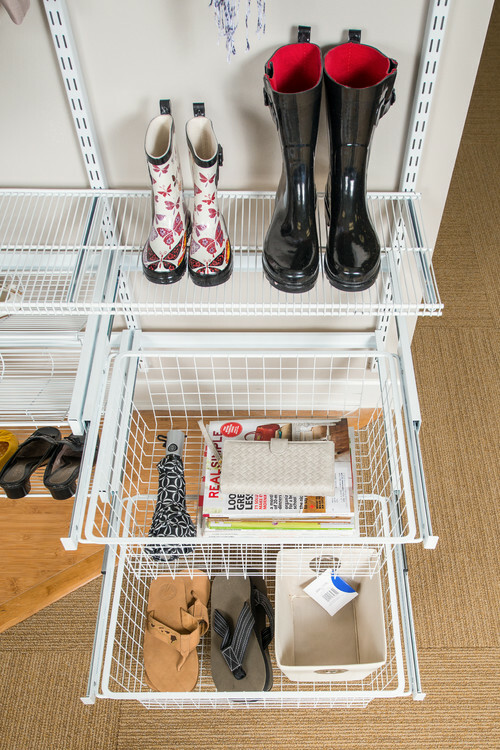 A bench, shelving, wall hooks and shoe storage will keep everything contained and out of the way. 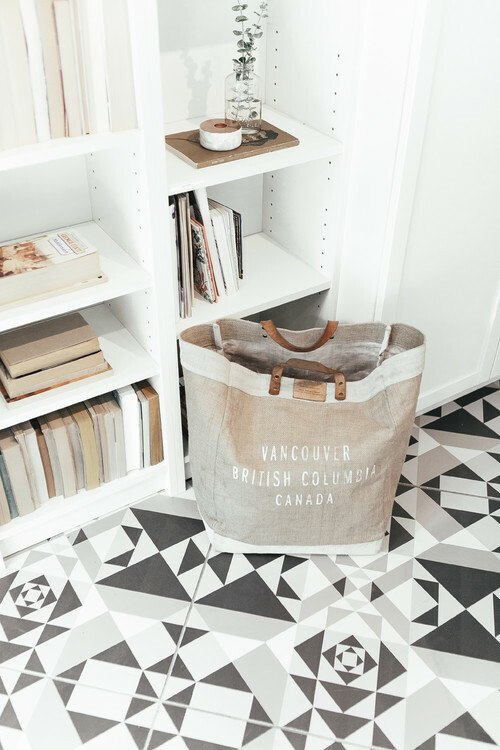 When it comes to setting up your hallway, the most important thing is to decide on a specific spot to store each item you typically come home with – post in a tray, keys in a basket, shoes on a shelf and so forth. If you’re extra vigilant about putting items where they belong right from the start, it will soon become a habit, and you won’t have to think about it at all. Giveaway collection basket A sturdy basket, bin or tote bag is useful for collecting stuff bound for the charity shop. So often, we hold on to clutter simply because there’s no clear route to getting it out of the house. Having a dedicated spot to gather items we no longer want or need makes the clutter-clearing process more straightforward. When it’s full, just grab it and go. Simple filing system With the option to get paperless bills and statements, the amount of paperwork you have to file at home may not be much, but don’t let this lull you into thinking you don’t need a filing system. Folders labelled in broad categories that make sense to you (car, home repairs, taxes) will help ensure you have what you need at your fingertips. If you feel you don’t have enough paper storage to justify purchasing a traditional filing cabinet, box files are just as functional, and you can use more or fewer as needed. 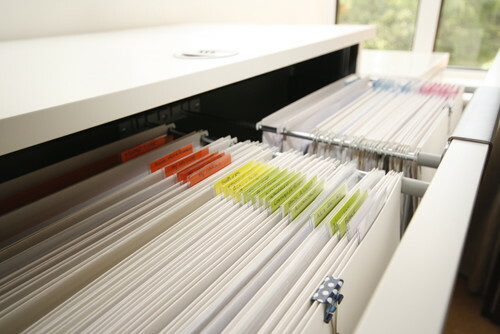 Whatever filing system you choose, be sure to keep it in an easily accessible spot. If it’s too hard to use it, you probably won’t. Laundry system Simple is usually best when it comes to laundry, but there are a few small additions to your laundry area that can really help: a small basket to temporarily hold socks without mates, a dish to collect items emptied out of pockets, and a few extra baskets or bags to separate delicate and dry-clean-only items. If you have a lot of hand-wash items, you may also want to invest in a collapsible drying rack that can slide away when not in use. 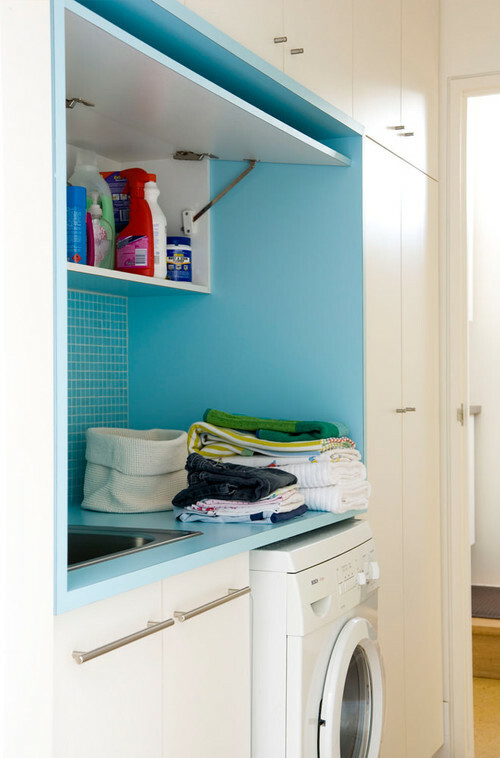 See how other designers and homeowners have organised their utility and laundry rooms. 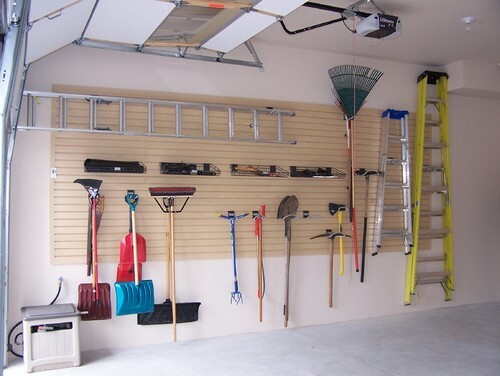 Wall-mounted tool storage In any storage area – whether it’s a garage, broom cupboard or basement – storing items off the floor is key for two reasons: it keeps things neat, and it protects your belongings from dampness. Long-handled tools can snap into wall-mounted holders, while other items rest on shelves. Home maintenance schedule If you’re a new homeowner, take the time early on to find the pros you want to work with and put regular home maintenance tasks (clean gutters in spring and late autumn, check heating systems) on your calendar. Being organised about home maintenance will help the systems of your house run more smoothly and can prevent major problems down the road.